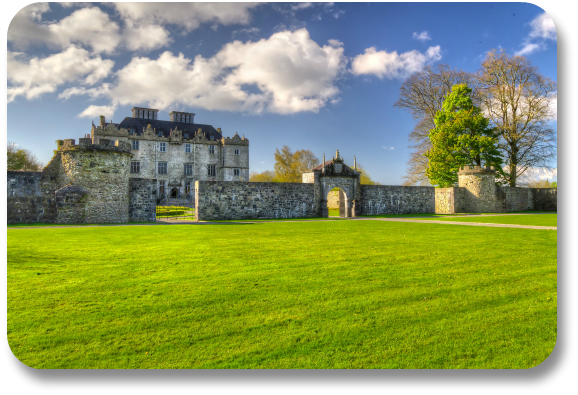 Central Ireland, in Connacht Province, is where you'll find the elegant Portumna Castle. To reach Portumna Castle in County Galway from the Dublin Airport, expect a two-hour drive heading west. Your journey by car will take you along the bustling M4 and the M6, and then you'll follow the much quieter R455 to Castle and Abbey Streets in Portumna until you reach the parking area for the castle. Unlike many of the residential castles in Ireland, which had defense as their first priority, Portumna Castle is only partially fortified. As a result, its exterior is more ornamental, and less fortress-like, than most other castles on this list. Portumna is located in County Galway, and it was built in the early 17th century by an earl. Incredibly expensive for the time, Portumna was the height of elegance and grandeur in Ireland in the 17th century. Although abandoned for nearly a century, restoration work in the late 20th century has reinvigorated the property, which is now open to the public.